Goats that produce spider silk protein in their milk could enable researchers to collect large quantities of the silk. Image credit: National Science Foundation. 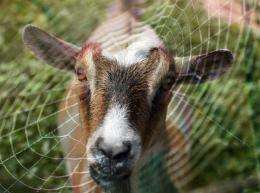 (PhysOrg.com) -- Researchers from the University of Wyoming have developed a way to incorporate spiders' silk-spinning genes into goats, allowing the researchers to harvest the silk protein from the goats’ milk for a variety of applications. For instance, due to its strength and elasticity, spider silk fiber could have several medical uses, such as for making artificial ligaments and tendons, for eye sutures, and for jaw repair. The silk could also have applications in bulletproof vests and improved car airbags. Normally, getting enough spider silk for these applications requires large numbers of spiders. However, spiders tend to be territorial, so when the researchers tried to set up spider farms, the spiders killed each other. To solve this problem, Randy Lewis, a professor of molecular biology at the University of Wyoming, and other researchers decided to put the spiders’ dragline silk gene into goats in such a way that the goats would only make the protein in their milk. Like any other genetic factor, only a certain percentage of the goats end up with the gene. For instance, of seven goat kids born in February 2010, three have tested positive for having the silk protein gene. When these transgenic goats have kids and start lactating, the researchers will collect the milk and purify the spider silk protein into “much, much higher quantities,” Lewis said. Other than their ability to produce the spider silk protein, the goats do not seem to have any other differences in health, appearance, or behavior compared to goats without the gene, the researchers said. In the future, the scientists plan to incorporate the silk genes into alfalfa plants, which they say could produce even larger quantities of silk. They explain that not only is alfalfa widely distributed, it also has a high (20-25%) protein content, making it an ideal crop to produce silk protein. I heard about this before. I wonder how it is different from the previous work. In 2000, Nexia, a Canadian biotechnology company, was successful in producing spider silk protein in transgenic goats. It's the same company, the same work. Checking the NSF link, the new developments include the 2nd generation, naturally bred, kids (3/7 of which got the trans-genes), advances in the spinning of the silk (the proteins are a gloopy mess in the milk, and spinning them into silk is a very difficult process), and the idea of adding the genes to alfalfa. Don't forget to sell the work off to Monsanto so they can destroy alfalfa fields and then sue the farmers for doing so. Besides wrecking the environment. Do you realize how completely INSANE it is to grow a plant with transgenic arthropod DNA? @quantum conundrum, you where really born in the wrong time, you should have been 500 years ago the world would have been more to your liking then. I really don't understand why people with your world view even bother to come to a site such as this, you're only going to give yourself a heart-attack. If it were left up to some of the people post in these forums, we would still be living in the dark ages and there would never be any progress in this world. This is a SERIOUS matter, you moron. Does whatever a Spidergoat does." What commenters so far have failed to appreciate are the new crime-fighting possibilities of this development. Bats will hang in webs, and hunt humans. Goats will learn to trap and eat chickens. Scrapie virus will travel the jet streams in huge invisible webs, descending on towns 'in masse', and we'll all forget our passwords, and develop Narcolepsy or terminal insomnia. How do these baby goats digest spider proteins in the milk? What happens when the activating chemistry gets into the feeding baby goats? Hey Hey, everyone, lets calm down a bit. Genetic engineering is powerful and dangerous, but the possibilities are god-like and awesome. We should not be afraid to work in this field, albeit VERY carefully. Just think, what if we engineered dust-mites that healed people, or better yet, eliminate disease altogether with gene therapy. It is a game-changing technology, and I feel if we were to master it, we could end up with things like intergalactic artificial life form spaceships (LEXX, anyone?). I mean, nature uses living creatures to function, at some point we can do the same. Think about it, why make nanobots if we can just create new forms of life using artificial self-assembling DNA. This could be the future, too crazy and awesome to be understood right now. The scary part is, life seems to have a mind of its own, able to mutate on the fly, driven towards self-preservation. We must be careful, but, we can do this. We CAN wield nature, but we must be VERY careful! VERY! A good analogy would be learning to control fire. Yes, you can burn yourself. And yes, you can burn down a forest. But you can also heat your home, power your car, even travel to the moon. If we are careful, the possibilities are endless. Sadly, once big business gets ahold of it, they are so often NOT careful. This is not a new video game. It is not the same as inventing fire. The downside is far worse. With fire you can't burn down the world. This is the power of God. It has positive possibilities that are unimaginable. It also has negative ones. Those who see the positive in it should consider that it will make nuclear weapons obsolete in 10 years, and that it costs almost nothing to do, and anyone with a master's degree in biology can do it. There has been no "careful" with its use so far, and there will be none in the future. The negatives will come more surely than the positives, at a ratio of thousands to one. The ignorance in these comments of how Monsanto's genetically modified corn spread to our food supply is astonishing. Eight plants feed the world. One mistake and billions die. Even if you do the diligence to figure out how to plug the leak before you drill, which we are apparently incapable of, and you will still make the mistake. There are too many variables. 21st century terrorism: Large corporations (effectively, non-human alien entities) produce transgenic organisms for profit while humans at large suffer the consequences of a lack of intelligent foresight. Then the technology becomes so commonplace and easy to execute that some scientifically-trained hate-filled fanatics decide that placing the gene for botulism toxin (for example) into the rice, corn or wheat genome would work well to terrorize billions of people. But the gene escapes into the global food production chain via windblown pollen and what was supposed to be a localized terrorist attack becomes a global catastrophe, leading to the death of millions via starvation or poisoning. Now that the genie is out of the bottle, things will have to run their course, even if billions die in the process. Now that the genie is out of the bottle, things will have to run their course, even if billions die in the process. Well, that'll certainly solve the population problem. Those of you who want to play Pollyanna with this and pretend that serious problems are unlikely must carry ostrich genes. Spidergoat, spidergoat, goes anywhere that a spider goes. Marketing 101: Create a need and then fill it. and you'd a have real serious weed on your hands. Of course, the creator of this toxic nuisance will then provide us with the 'environmentally' friendly chemicals to kill it off... maybe. Eerily similar to the Sci-fi channel super heroine movie "Ultra Violet". Although this does give us a way to win the war on drugs. Take some poppies, Marijauna, and Coca plants and splice in some DNA from Australian Irochongi Jellyfish Venom. Then grow loads and loads of the pollen and spread to Afghanistan, Mexico, and Central America respectively.. Damn, I was actually searching for a spidergoat comment and somebody beat me to it. Oh well, "Can he swing from a web, no he can't he's a goat...........". This is disturbing to me. I understand that we need to use science to solve our modern problems, but isn't that why we have lady bugs for no reason. Science sometimes goes very wrong and we don't know this until it is too late. I am stuck wondering why someone would come up with idea of making goats milk into a spider web silk substitute. That is beyond creepy. I get it that the silk is important, but adding a gene to a goat to mutate its milk is way too sci-fi. This reminds me of the movie "Splice" coming out. It looks disgusting. @Quantum, before you call someone a "moron" you really should read your posts before you send them. You have been watching too many bad sci-fi movies. Genetic engineering is a powerful tool that will allow humanity to control it's future, yet people like yourself can only imagine the mad scientist playing god. I'm sure you believe that life came to be by fairy dust or some such nonsense. This is not a new video game. It is not the same as inventing fire. The downside is far worse. With fire you can't burn down the world. This is the power of God. There [probably] is no god you neanderthal. we have dogs which can kill a wolf but if we relese a pack of them in the wood will they survive? Yes, they would if they were in a place with no native wolf packs. wild dogs roam places all over the world and do just fine. Expression of transgenes is usually controlled by choosing specific promoters for other genes that are expressed in very few tissues. The problem with expressing something only in the stem is that most of the genes in the stem are also active in most other parts of the plant as well. The stem is, to oversimplify, a more primitive part than the flowers or fruit. However, the genes it expresses, due to their "primitiveness" tend to be expressed throughout the plant. So unless a promoter specific to stems and leaves is found, expression cannot be controlled. Your criticism, then, is not in the methods or dangers, but in your gut feeling?